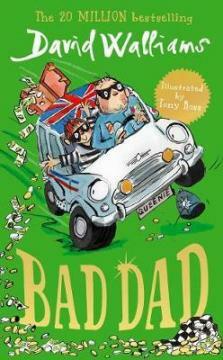 Purchase a copy of Bad Dad by David Walliams & Tony Ross (illus) from your local independent bookseller for your chance to WIN 1 of 3 David Walliams box sets. For your chance to win, simply quote your receipt number, the name of the bookstore name you've purchased Bad Dad from and answer the following question in the answer field. QUESTION: Tell us in 25 words or less which David Walliams book is your favourite and why. TERMS & CONDITIONS: Entries close 31/1/18. The winning entry will be judged by the National Group Manager of Leading Edge Books on 2/2/18 at Level 2, 72 Archer Street, Chatswood NSW 2067. The winners will be notified by email. By entering this competition you agree for your email address to be added to Australian Independent Bookseller mailing list. Your email address will not be used for any other purpose and you may unsubscribe at any time. Entry is only open to Australian residents. Employees and immediate relatives of Leading Edge Books members and their direct suppliers are ineligible to enter. All entries remain property of Leading Edge Books, the judge’s decision is final and no correspondence will be entered into. The prize is not redeemable for cash.